Metadata provides context: the who, what, where, why, when that helps you to discover and interact with information. Often defined as “data about data”, metadata is a mechanism for describing data or content to enhance its usefulness. It is a key component to both data and content management, with established practices in different domains such as computer science, data warehousing, and particularly in libraries. 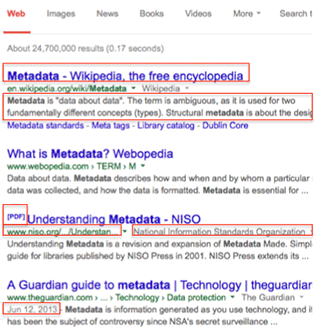 In a library and digital collection context, metadata is a critical information product that connects users to digital content, enabling not only the “findability” of content within different search environments, but also facilitating contextual user interface/interaction and even long term data preservation capabilities. Metadata is all around you! It helps to drive search engines and social media, not to mention that it powers library catalogs like Emory's discoverE. Metadata can be created in many different ways. At its simplest, it's often created in a spreadsheet, and then imported into a more robust system. Metadata is often stored as records in a database, as part of the HTML code for a website, or as XML files.